The San Bernardino National Forest has a new district ranger for its Front Country Ranger District. Joe Rechsteiner comes from Dixie National Forest in Utah, where he was the Pine Valley District Ranger. He fills the shoes of Christine Hill, who has moved to Mendocino National Forest as the Grindstone District Ranger. Both started their new roles on Monday. Rechsteiner has worked for the U.S. Forest Service for 17 years. He started his career in 2001 on the Uinta National Forest in Utah, where he worked in special uses and recreation. Three years later, he transferred to Dixie National Forest as a district recreation and lands staff officer before becoming a district ranger in 2013. Although his entire Forest Service career has been in Utah until now, Rechsteiner is not new to the area. Born and raised in San Bernardino, he has fond memories of visiting the forest. As a child, he frequented Forest Falls and Vivian Creek, both which are in his new district. And during the 1990s, he backpacked the San Gorgonio Wilderness, also in his new district, many times when he was stationed in San Diego while serving with the U.S. Navy. The Front Country Ranger District is one of three districts on the forest. It encompasses 235,685 acres of Forest Service land, from the eastern end of the San Gabriel Mountains, running east across the Cajon Pass and along the south-facing slopes of the San Bernardino Mountains. The district includes Sand to Snow National Monument, which is co-managed by the U.S. Forest Service and Bureau of Land Management. 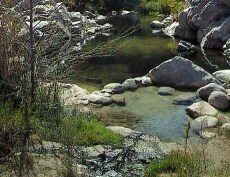 There are three visitor contact stations, which are located in Lytle Creek, Mill Creek and Barton Flats, which is open during the summer. Rechsteiner is excited to return to the forest he grew up visiting. During his free time, he is an avid hiker, mountain biker, skier and camper.